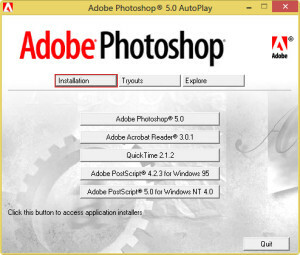 This entry was posted in Adobe, Reviver and tagged 32bit, 64bit, Adobe Photoshop 5.0, How to install Adobe Photoshop 5, How to install Adobe Photoshop 5 Windows 10, How to install Adobe Photoshop 5 Windows 7, How to install Adobe Photoshop 5 Windows 8, Installing, photoshop 5, This app can't run on your PC. To find a version that runs with your PC check with the publisher., This app cannot run on your PC, Windows 10, Windows 7, Windows 8, Windows 8.1. Bookmark the permalink. I downloaded Longbow yesterday with no problem. 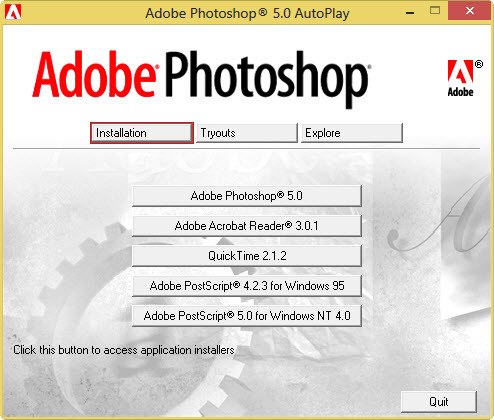 Then I followed the above instructions for Photoshop 5.0 LSE without any problem, until after using the Old Program Reviver to Fix Old Program. That is, Photoshop does come up from the shortcut, but there is a blue spinning wheel that never stops spinning so I can actually use Photoshop. Any ideas?